Need Safe Housing? We believe you. Dunn House Shelter is a safe place for who need to leave an unsafe situation. Dunn House is a safe place for women, children, and men to stay while learning about options and making a longer-term plan for safety while escaping domestic or sexual violence. Services are available in both English and Spanish. Dunn House Shelter is a large home where several families reside. Food, clothing, and personal care items are provided and the services are free and confidential. Advocates provide emotional support, information, and referrals to community services. Advocates can help people with court advocacy and legal referrals, parenting support groups, transportation, and help with non-violent parenting techniques. Children at Dunn House Shelter have a safe place to play, to spend time with their parents, and to be involved in age-appropriate activities. Kids also have opportunity to be involved in support groups and learn more about safe and healthy relationships. Do you have a safe and permanent place to live? 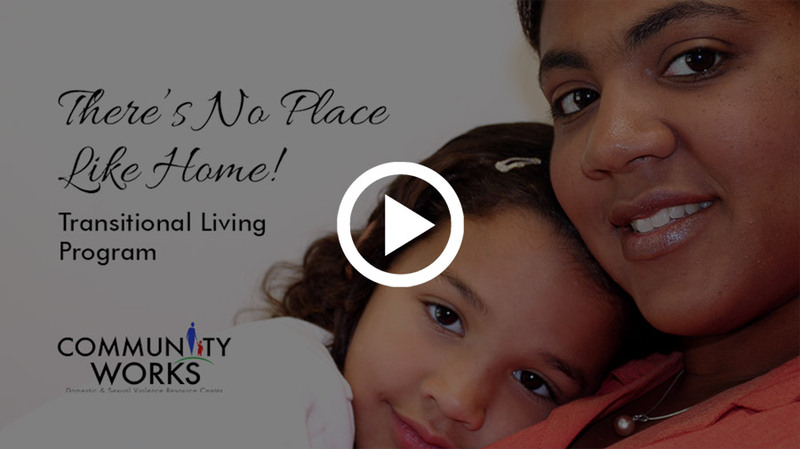 If not, Community Works’ Transitional Living Program (TLP) may be able to help. For young people, ages 16 – 25, TLP provides a safe and individual apartments while young people continue education, learn life skills, work, and build a brighter future. This program is available for youth with or without children of their own. If you are a young person without a safe and permanent place to live, help is available. Community Works is here to support you as you build a safe, independent future.